How do I tag multiple photos in Lightroom? I'm processing a batch of photos in Lightroom 3.2. They are all of a Fall nature, so I want to apply the "Fall" keyword to the lot (31 of them). When I select all of them (click, shift+click), then enter the keyword in the Keywording box (in Library view), "Fall" is only applied to the first image that I selected, not all of them. I seem to recall this works in Bridge. Is there a different way to go about it in Lightroom? When bulk tagging, you need to make sure you are in library mode, AND that you are selecting photos from the main grid, not the film strip. I think this is a bug in LR3, however if you select multiple photos from the film strip, and then try to tag them, the tagging does not always take. It usually applies to the first photo selected, but not the rest. There seems to be a threshold to this...if you select only a few images in the film strip, it may work, but more than say 8-10, and it usually does not. 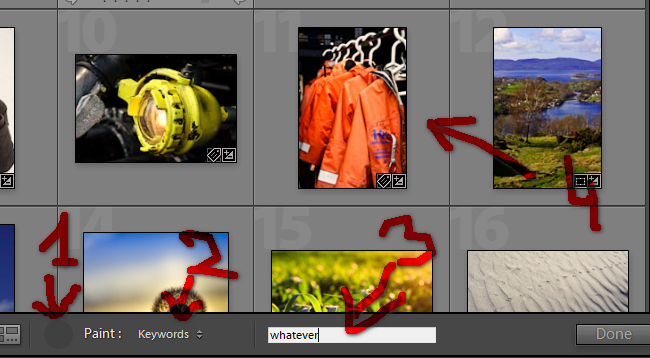 When selecting multiple images from the main grid in Library mode, bulk tagging works fine. Just remember to hit the enter (return) key in the keyword box before moving on to make certain the update is actually applied to all of the selected images. In my experience, bulk tagging in the grid has always worked, while bulk tagging from the film strip has been sketchy at best, and generally never seems to work. 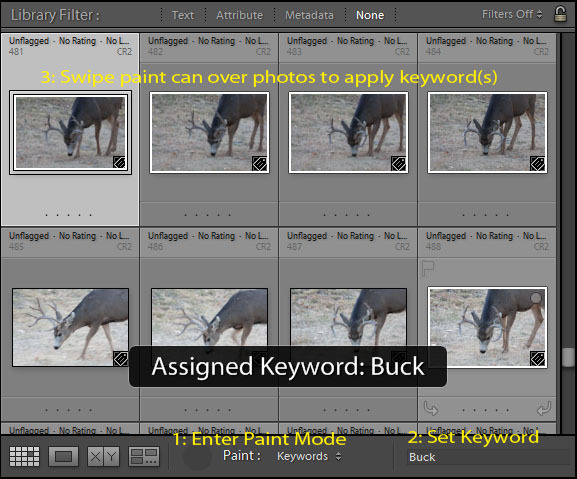 An alternative mode of tagging is to use the library painter. It is a small spray paint can icon next to the view mode icons below the grid in Library mode. Selecting this, it defaults to Keywords. Just enter the keywords you want to add, then click on the images you wish to add the keywords to. You can either click each image individually, or click and grad the spray can over multiple images in a continuous stream to "paint" on the new keywords. Click the icon below the grid again to disable paint mode. No, it works like you say. Are you sure you have selected all the photos? When you select multiple photos and you add a keyword, Lightroom asks you if you want to apply the setting to all the selected photos. When I do this in Loupe view, the keyword is only applied to the photo that is visible, even if multiple photos are selected in the strip at the bottom. If I do this in Grid view, then the keyword is applied to all the photos in the grid. The solution for me (LR3.5) was simply closing LR (and letting it back up the catalog settings), then re-opening it. Works fine then. Not the answer you're looking for? Browse other questions tagged lightroom tagging keywords or ask your own question. How can we sync Lightroom 5 metadata changes over Dropbox? How do you get HDR tiff files from Photomatix/HDR Efex Pro to show up in Lightroom? How do I select just the photos with the top level keyword in Lightroom? How to recover deleted Lightroom files? Lightroom - How Do I find Photos that are Missing Copyright Metadata? 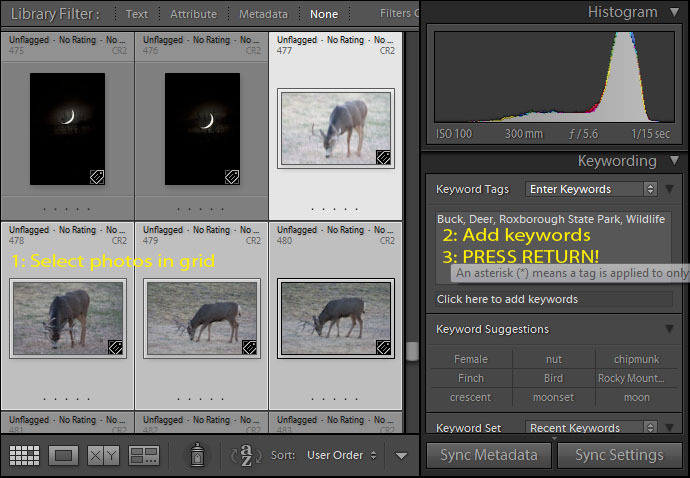 How can I remove all keywords from Adobe Bridge?